The bilge pump article provides guidance and reviews about different types, quality, durability and prices of this pump. The bilge is the lowest or bottom compartment on a ship or seaplane. Bilge is usually under the waterline, where the two sides or edges meet. The automatic bilge pump is a water pump that is used to remove water entering the ships or seaplanes through these bilge regions. Normally the water that has no way to drain from the ship are collected at the bilge region. This water may be collected from the ocean currents, rainwater or due to leaks through cracks in the ships exterior or internal spills. This unwanted water if left unremoved may even cause the ship to sink. The bilge pump is used to remove this unwanted water accumulated in the bilge region of our ship. The pumps are mainly used in marines, ships, seaplanes, etc. They are also used for plumbing and ventilation purposes in household and factories. The primary function of this type of pump is to clear unwanted water in the bilge region. Nowadays boats and ships come with built-in bilge pump. They have become one of the basic need for every boat or ship. Apart from removing unwanted water, the pump act as our last line of defense against the sinking of the boat. A small pump is enough to pump out the unwanted water that collects in the bilge region. Large pumps are required in the case of emergencies. The pump provides us with extra time to find the leakages across the boat, and the leaks can be fixed before causing any damage to the ship. In extreme cases, pump provides additional time to put on life jackets and make our ships afloat until help arrives. Automatic pumps are usually electrically powered, and few small pumps are battery powered. Larger pumps need large batteries and are tough to occupy in small ships. Bilge pumps are installed at the place below the outer water level, and they pump the water to the exterior through raised outlet pipes. These pumps are usually susceptible to failure because they operate in water and are electrically driven. So it is important to have an additional high capacity emergency bilge pump. A float is attached to the bilge pump, and it gives the signal to the pump based on the water level. The emergency pump must be installed at about 10-15 inches above the pump depending upon the size of the bilges. Emergency pump must have a separate float system so that once the primary pump fails and touches emergency water level. The float switch must activate the emergency pump. The pumps must be installed in accessible areas so they can be cleaned to avoid oil spillage and debris collecting around the pump. We can add a filter to the pump so that the pump is not damaged by oil spills, debris. 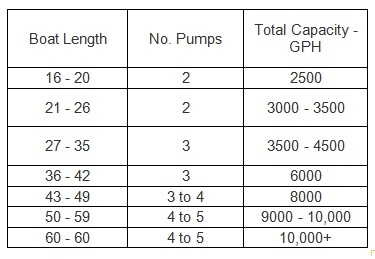 1) Type of pump - whether we should choose centrifugal pump or diaphragm pump for the application. Centrifugal pump-inexpensive, simple design, large pump so huge quantity of water can be pumped, easy maintenance. Diaphragm pump – they are used when we have pump water vertically up for large distances. 2) Capacity of the pump- The capacity can be determined by the amount of the water that can be pumped out for the specific period. 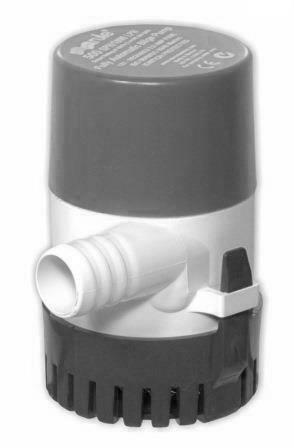 The capacity of this pump is usually measured in Gallons per Hour(GPH). For example, 24GPH corresponds to 24 gallons of water pumped out in the time frame of 1 hour. As per the latest analysis of American bureau of shipping(ABS), one 1440GPH pump and one 720GPH pump is the minimum requirement for boats less under 65 feet. 3) Number of pumps – we must decide the number of pumps to be placed in our ship and it depends on the no. of bilge locations in our ship, style of our boat, the length of our ship and the capacity of pumps to be placed. There have been no standard criteria given for these considerations but we can assume the following as minimum needs per the length of the boat. They are available across many of the familiar websites with such as Amazon, Walmart, eBay, etc. Some of the manufacturers of these pumps are Johnson pumps, Saiflo pumps-china, Attwood Sahara, etc. They are priced depending on their brand, capacity from as cheap as around 70$ to higher prices up to around 350-400$ for domestic and small scale purposes. Large ships and big scale industrial pumps cost depending upon their need capacity of water pumped, durability and life period and are expensive.